I love this recipe so much that I'm ignoring my Saturday night ironing and floor cleaning so I can share the recipe with you. And, I'm trying to distract myself from eating the last piece of fruit pizza that is staring at me. This recipe is from my sister-in-law, Annelisa, who is a fabulous cook! Everything she makes is delicious! This "pizza" has a sugar cookie crust, layered with cream cheese "frosting", topped with fruit and then a pineapple juice glaze. 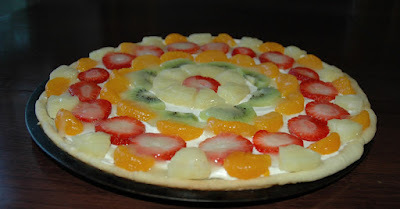 I made this fruit pizza last night and my family ate lots of it for dinner (along with some pancakes). It's healthy since it's "fruit" pizza, right? This would be a yummy treat for Valentine's day. If I lived closer to my dad, I would make this for him. He loves sugar cookies! It would be fun to make the pizza in a shape of a heart. Cream together butter and sugar. Add egg. Then add together flour, baking soda and cream of tarter. Press onto a 14" pizza pan. Bake at 350 degrees for 10 minutes. Let cool. Beat cream cheese until smooth. Add sugar and vanilla. Spread of cooled crust. Arrange fruit of your choice on frosting. Can use strawberries, kiwi, bananas, mandarin oranges, pineapple, etc. Heat 1/2 c. pineapple juice in saucepan. Mix in 1 Tlb. cornstarch . Cook until thick. Pour over fruit. This will keep the bananas from turning brown. Chill.